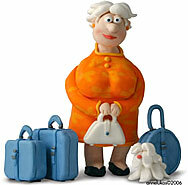 Virginia polymer clay artist Ann Lukas has been described as a three dimensional cartoonist. For fifteen years she has created humorous custom logos, character and spot illustrations for use in publishing and advertising. You’ll find Ann’s work on the sites of several artist representatives. Look here for a few more of her illustrations. Thanks to Susan Rose for passing the link along. Be sure to catch Maggie Maggio’s new color scales video tutorial on her Smashing Color site. It’s a terrific way to learn color mixing. How sweet and professional they are ..! Thanks for the link! contattami al piu’ presto voglio ordinare degli stampi e non so come fare saluti italia.